After what I felt was buying every statement necklace in sight last year, my jewelry buying from J.Crew waned somewhat as 2014 came to a close, and most of my necklace purchases were of the pendant variety. I started to think perhaps my love affair with statement necklaces was over, but fear not, the spring rollout came and I found several new necklaces to love. I usually wait a bit for the jewelry to hit sale, but in this case a 25% promotion and a generous birthday gift card was enough to get me to bring these beauties home. 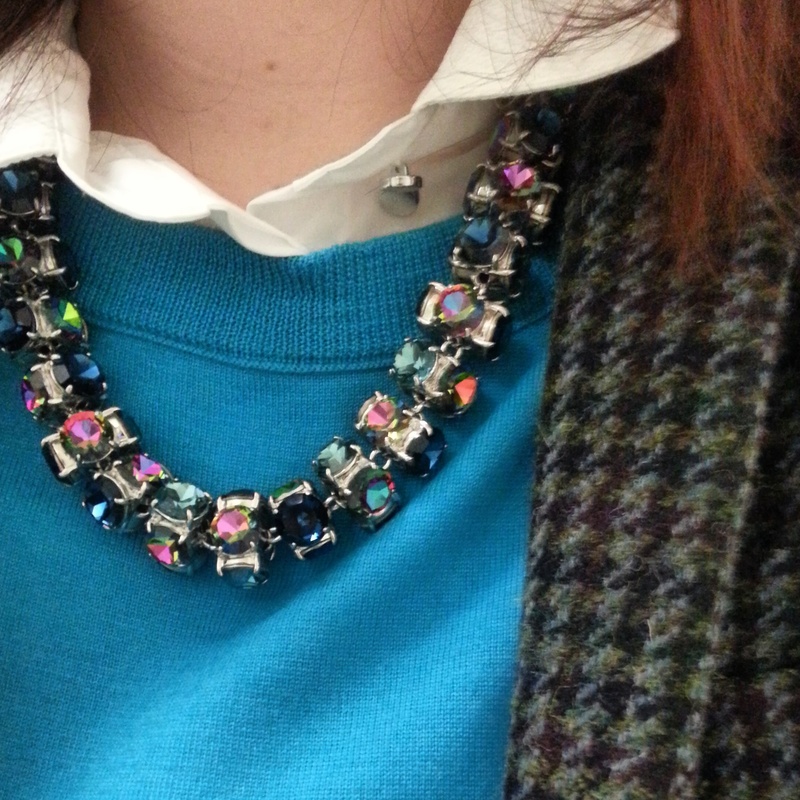 And perhaps the fact that it had been months since I bought a statement necklace. 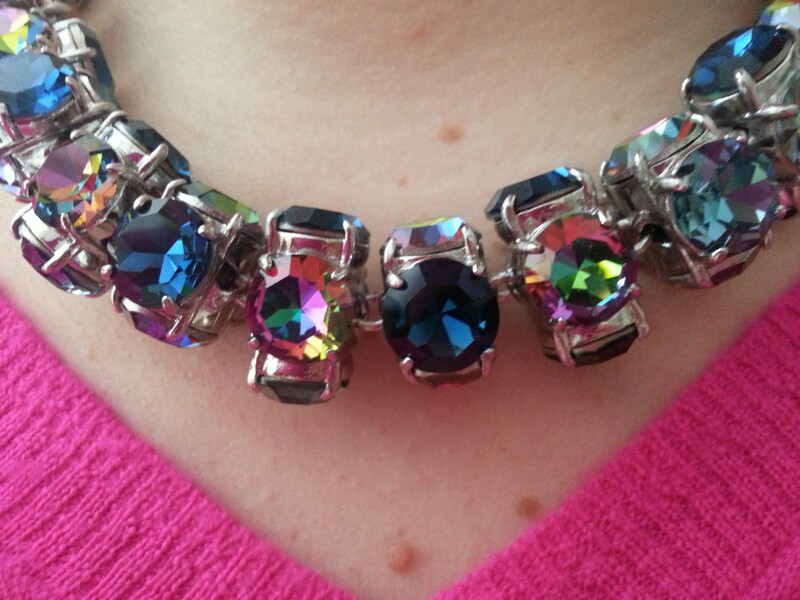 First up, the Full Spectrum Crystal Necklace in vivid ink. Calling this necklace vivid ink would lead one to believe this necklace is blue toned, and it is, but it is exactly what it’s name implies – a full spectrum of color. 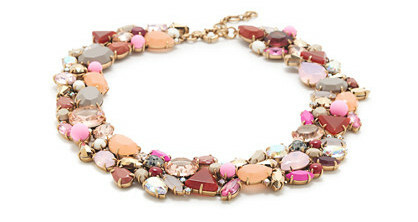 As seems to be the case with a lot of J.Crew’s jewelry lately, the online photos do not do this necklace justice. I first saw this necklace in store and thought it was absolutely beautiful. I have always been a sucker for iridescent items (must be the 80’s girl in me). 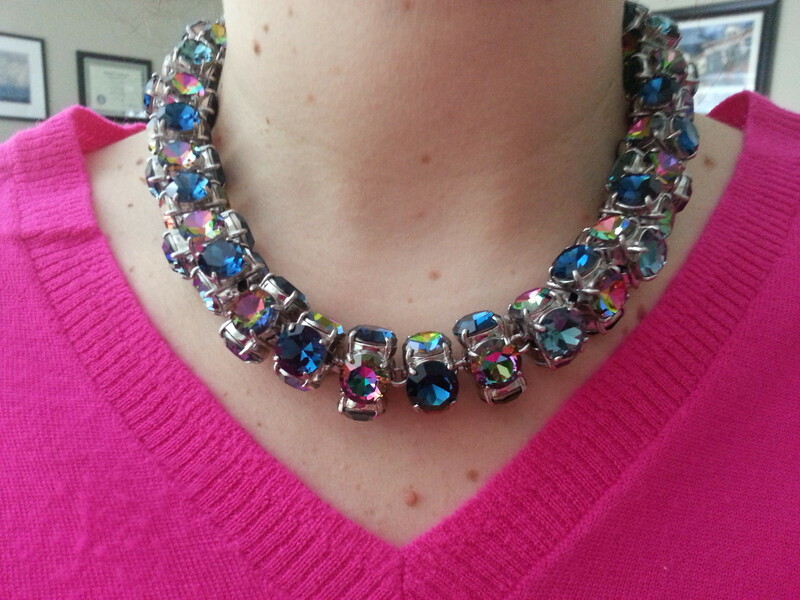 As you can see, the necklace pulls a full rainbow of colors, with blue and pink being the primary hues. The necklace looks and feels heavy when you hold it, but I did not find it heavy while wearing it. Here’s a closeup of the gems. I actually like the somewhat longer length so I think this is how I will be wearing it most often. 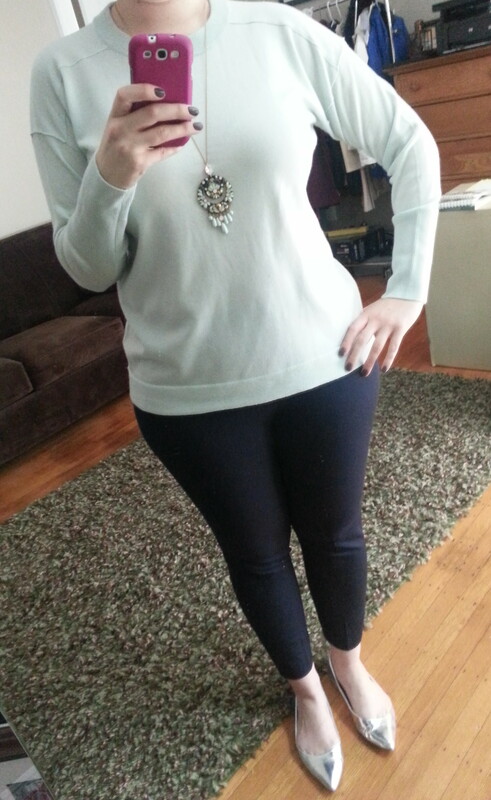 As you can see, when I wore a blue sweater, the necklace pulled more blue hues. 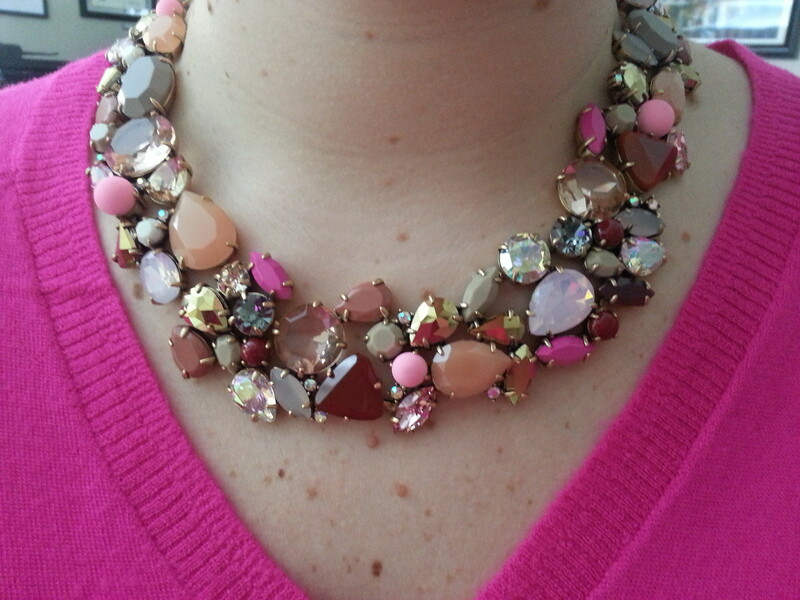 I anticipate getting a lot of use out of this necklace this spring/summer and beyond! Next up…the Crystal Foliage Necklace. Again, this is one that I may not have looked twice at online had I not seen it on a few people on Instagram. I love the color mix in this necklace and while the name implies that it would be an autumn appropriate necklace, with the colors included in the necklace, you can take it from spring right on through fall. There are so many beautiful colors in this necklace – hot pink, pearly opal color stones, peach, burgundy, pale pink, light purple, the list goes on. 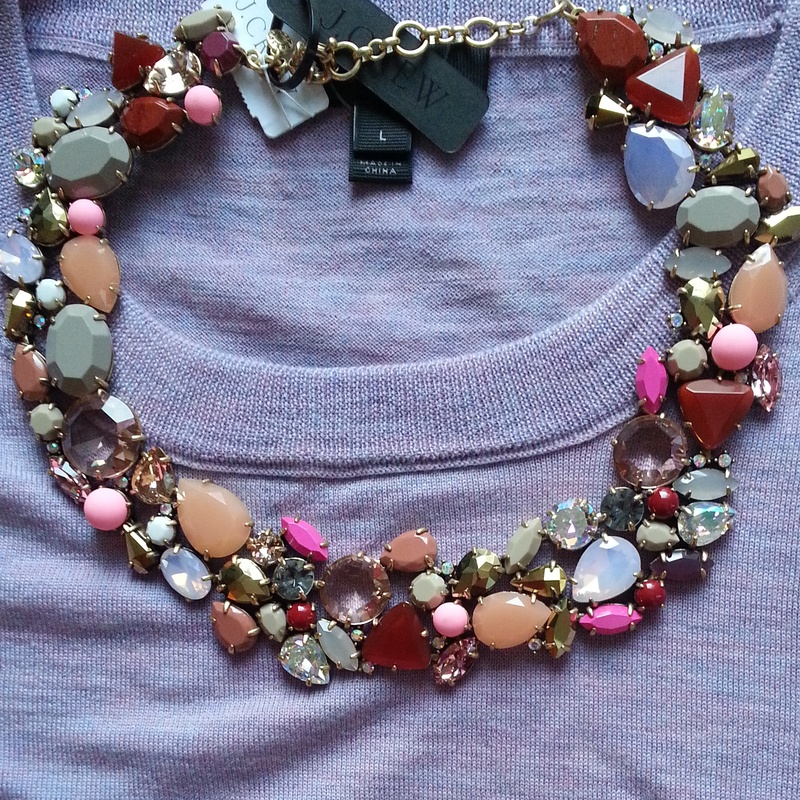 Here is the necklace paired with the J.Crew Tippi sweater in heather lavender. And again, here it is with hot pink. I’ve also seen this paired with coral and I think pale pink will be perfect too! 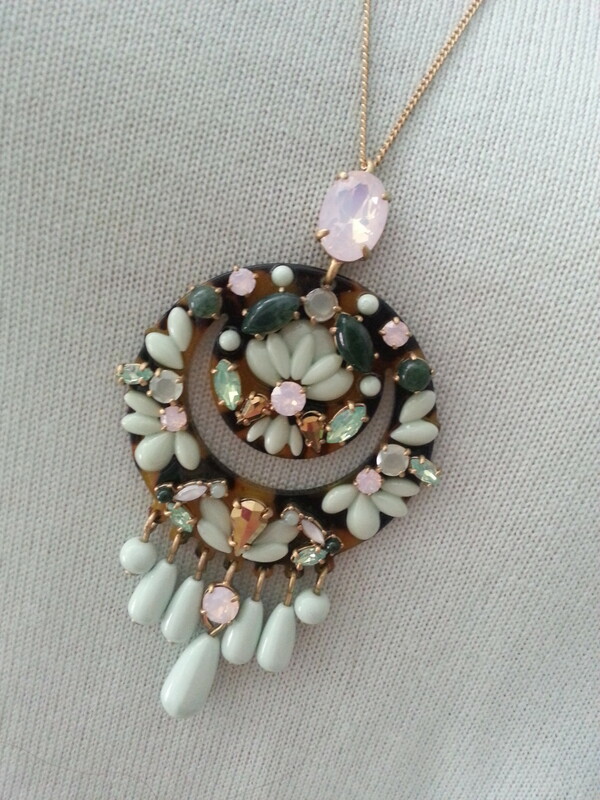 I also have my eye on the navy/yellow/mint version of this necklace (the Spring Bloom Necklace). And last up…the Crystal Floral Pendant Necklace. In my attempt to procure all things mint this spring (more about that in another post), I figured I’d try this necklace, and again, it is even more pretty in person. Here’s a full length outfit shot with the J.Crew Merino Cotton Tunic in Mint White (wearing size L) and the J.Crew Martie Pants in Navy (wearing size 12). So there you have it, a few of my J.Crew spring jewelry favorites. How about you? 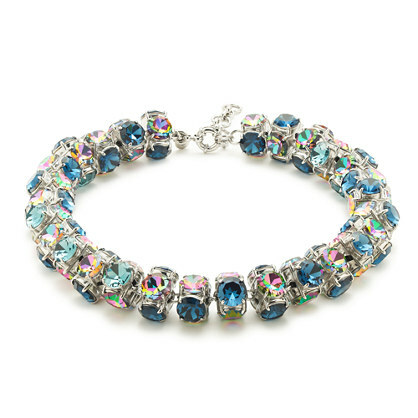 Are you liking any of the recent J.Crew jewels? Would love to hear what you think and thanks for reading! The crystal foliage necklace is my favorite. I loved the picture from your IG. I LOVE these pieces (as you know)! They look FAB on you!!! I LOVE all of these pieces, as you know! Thanks for the great styling options, as always!! !